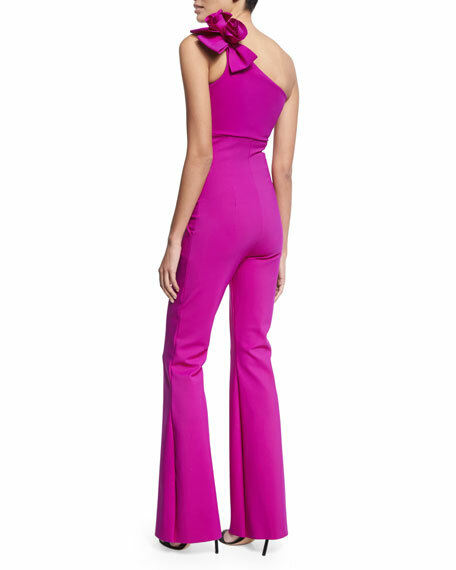 La Petite Robe di Chiara Boni "Beba" jumpsuit in stretch jersey. One-shoulder neckline with ruffle trim. After a few years' break from fashion, in which Chiara Boni dedicated herself to politics with an important role in the Regione Toscana, Chiara asked herself a new question: "What would I wear?" This pushed her to create a brand new concept: La Petite Robe di Chiara Boni, in 2007. Elegance, comfortable, versatility, and great fits are key drivers of this line. Perfectly folded up in an organza pouch, her creations represent the ideal wardrobe for traveling. For in-store inquiries, use sku #2147003.